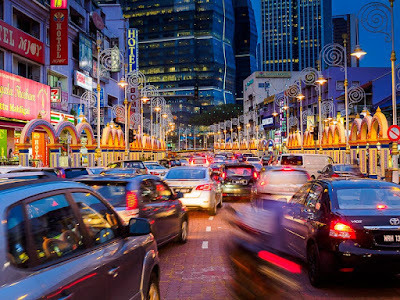 Traffic in the Little India section of Kuala Lumpur. Bollywood music blares from speakers on the street which is lined with Indian restaurants and food stalls. I've been in Kuala Lumpur for a couple of days after being in Kulai. KL is a fascinating blend of Malay, Indian and Chinese cultures. 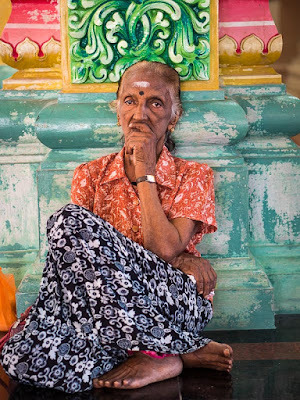 The British colonial authorities brought millions of Indian laborers here to work the tin mines and rubber plantations that financed the colony. The Chinese came here in a burst of entrepreneurial zeal. KL feels like a cross between Bangkok and Singapore. It's not as chaotic as Bangkok but not as ordered as Singapore. It's very spread out and I only saw a tiny part of the city. More or less the "old" Kuala Lumpur - Chinatown and Little India. 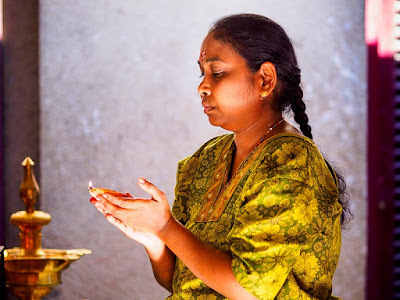 A woman praying at Sri MahaMariamman Temple, the largest Hindu temple in KL. 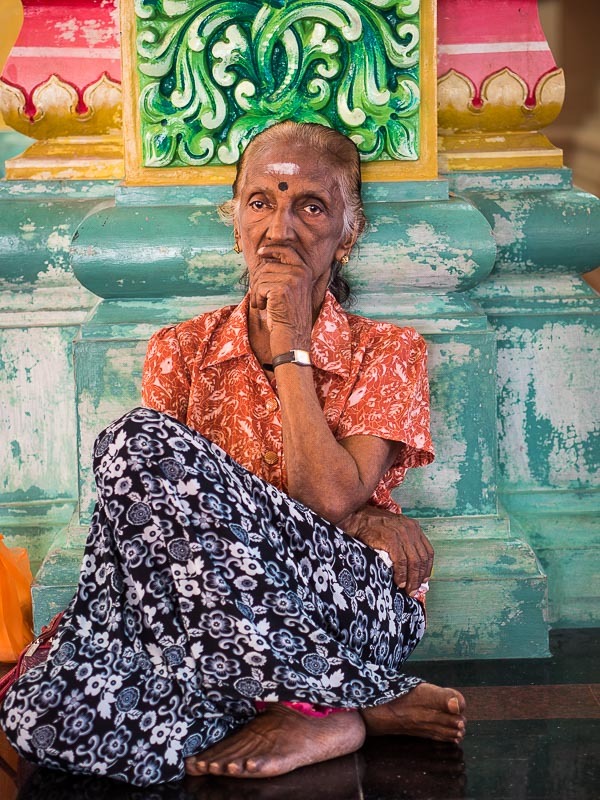 A woman waits for midday prayers to start Sri MahaMariamman Temple. 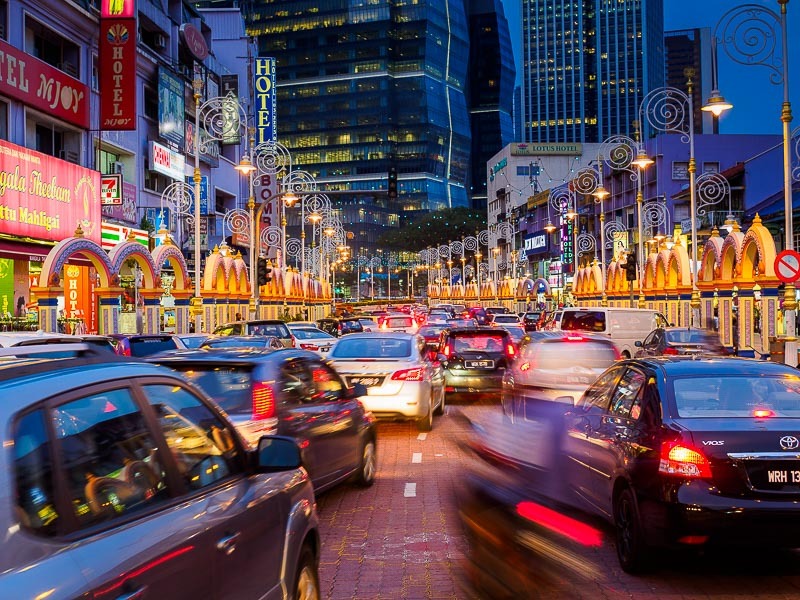 There's a very cosmopolitan vibe to KL. There's tremendous diversity on the street, from Malay Muslim to Indian Hindu to Chinese Taoist to European Christian. The diversity is represented in the cuisine. 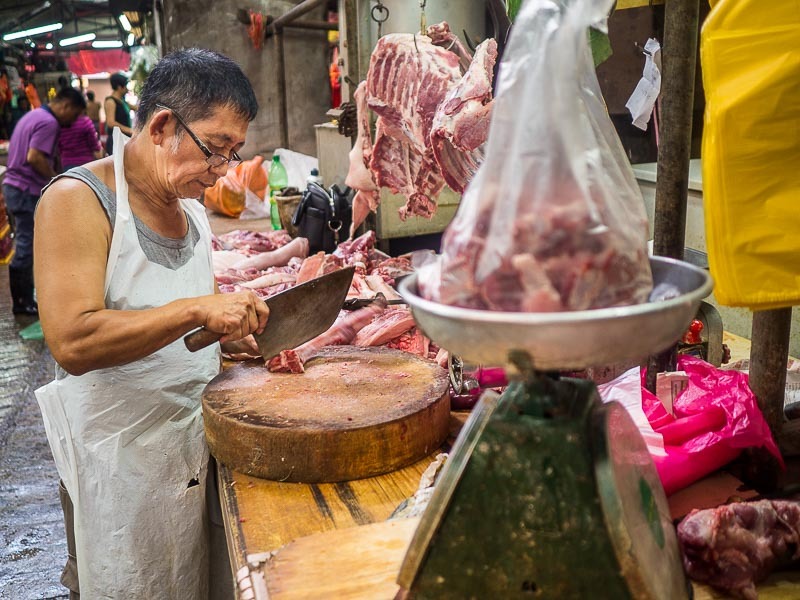 There are a lot of Malay (and other Muslim) Halal places, but the Chinese places have lots of pork on the menu along with traditional noodle soups. And the Indian restaurants run the whole spectrum of Indian food. 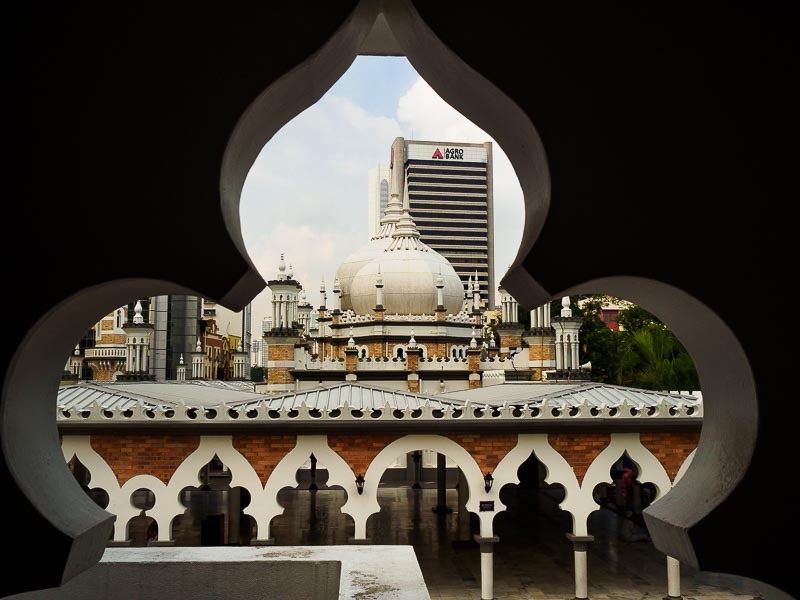 The roofline of Masjid Jamek, one of the most important mosques in Malaysia. KL is an interesting place. 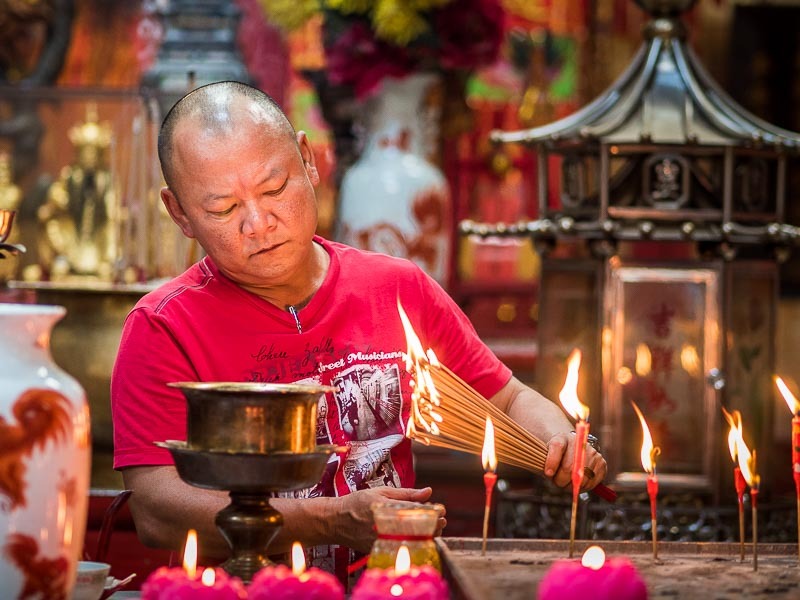 If you're in Bangkok or Singapore and have a day or two extra to spend, KL would be a worthy stop. It's inexpensive (my hotel was $23 a night) and the people are friendly. I had a good visit and wouldn't hesitate to come back. 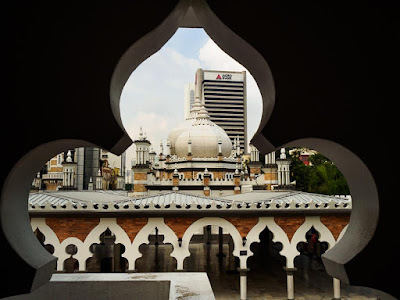 Some more photos from Kuala Lumpur. A butcher selling pork in a Chinatown market. 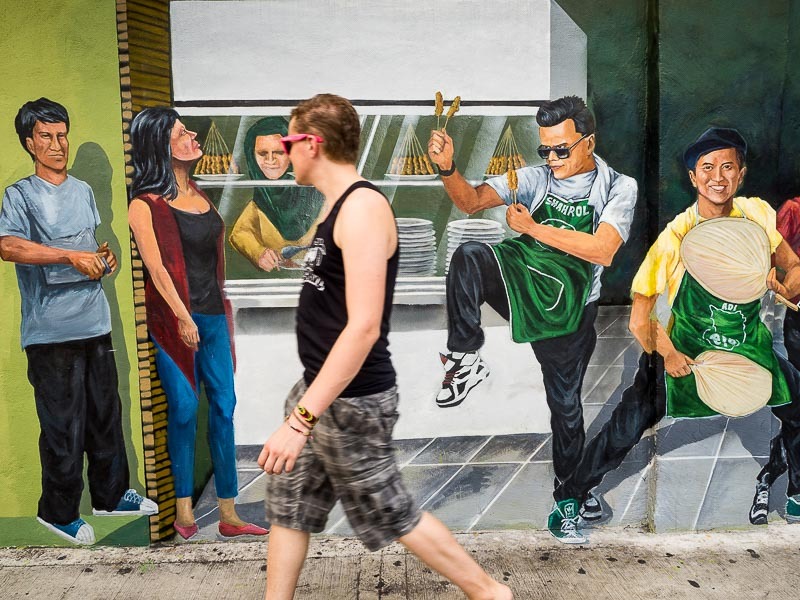 A tourist walking past a mural near the old Kuala Lumpur Central Market. 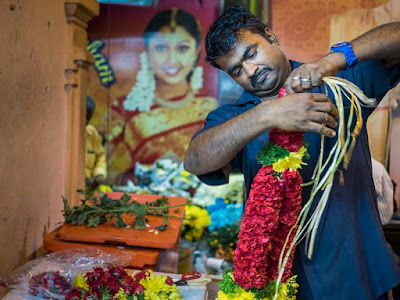 Making and selling flower garlands in Little India. There are more photos from Kuala Lumpur in my archive.